Fact: I prefer bars over cookies (as evidenced by the fact that I have twice as many bar posts as cookie posts). Clearly, this isn't because I make 50 batches or so a week for my job--if anything, that's a deterrent! No, I like a)their simplicity in making and baking, b)the fact that just about any typical cookie dough can be pressed into a pan and turned into a bar, and c)you can cut each bar as large or as small as you feel you need at that moment. 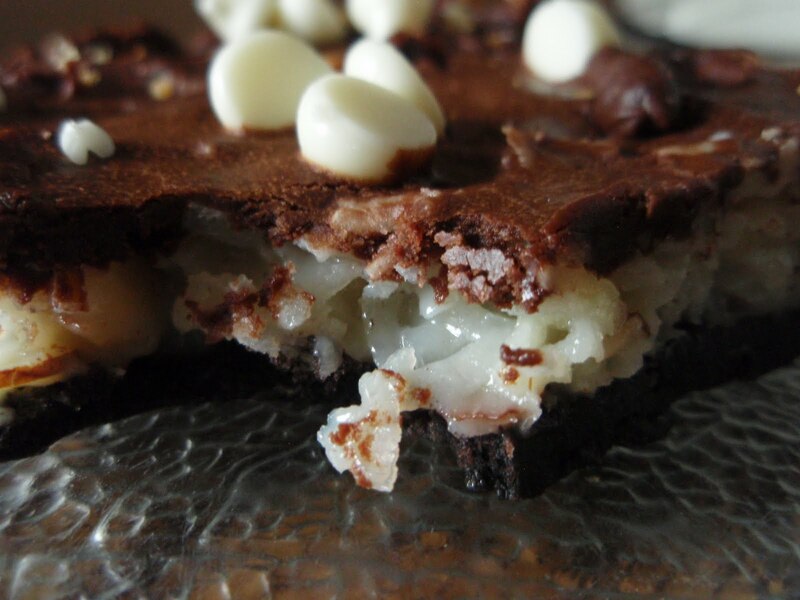 These beauts are an example of cookie-inspired bars. When one examines the macaroon (my definition of it, anyway--many variations exist), one finds coconut combined with egg whites and sugar and baked in little blobs that often get dipped in chocolate after cooling. Ground nuts are sometimes involved. 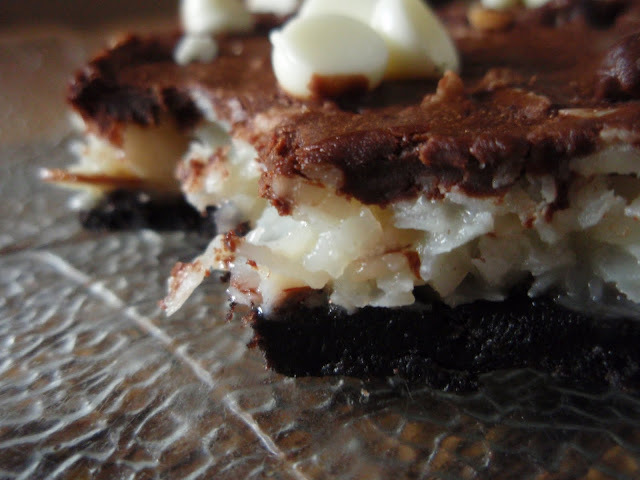 The similarities between these bars and coconut macaroons begin and end with the presence of coconut, chocolate, and nuts. I think these are more like short and squashed Mounds or Almond Joy bars, and that's thrilling to me. The filling is something I can see myself using between cake layers or as a slightly sinful snack. My next plan of attack is to double the filling, cut them into long, thin rectangles, and pour chocolate such that it drapes over the sides and the end result is more candy-bar-like. Who would ever want a dinky little cookie after that? Combine crumbs, melted butter, and powdered sugar in large bowl. Firmly press crumb mixture on bottom of prepared pan. 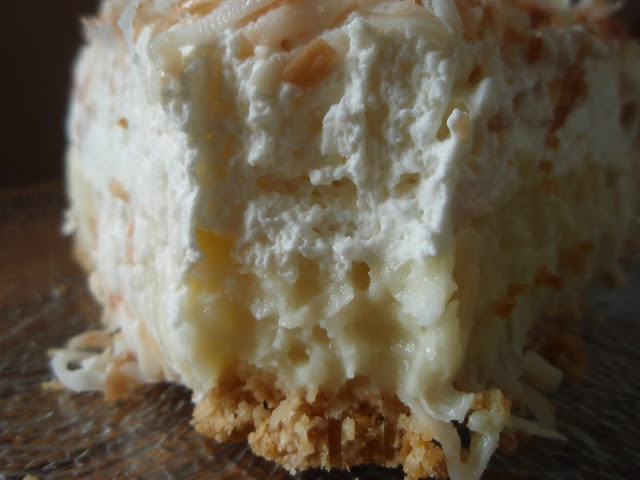 Stir together sweetened condensed milk, coconut, and almonds in large bowl, mixing well. Carefully drop mixture by spoonfuls over crust; spread evenly. Bake 20 to 25 minutes or until coconut edges just begin to brown. Cool. 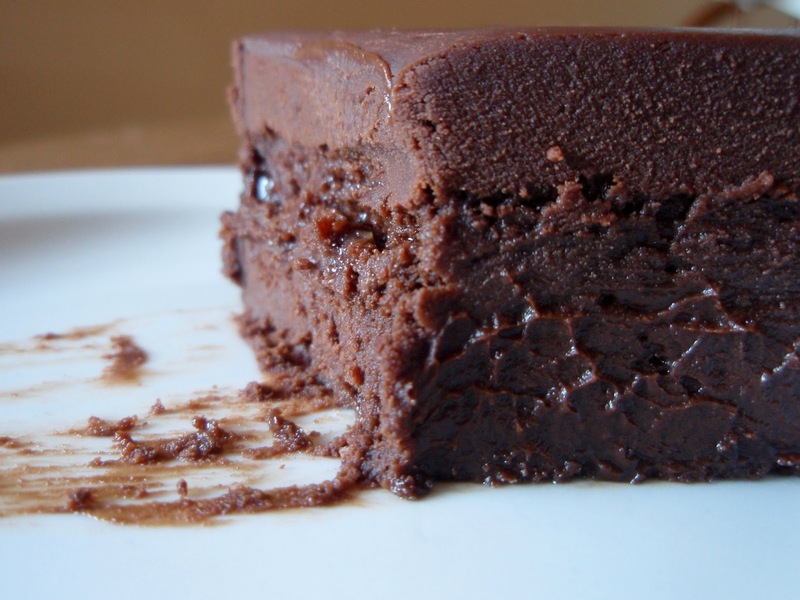 Place chocolate chips and whipping cream in medium microwave-safe bowl. Microwave 1 minute; stir. If necessary, microwave an additional 15 seconds at a time, stirring after each heating, until chips are melted and mixture is smooth when stirred. Cool until slightly thickened; spread over cooled bars. Sprinkle top with white chips. Cover; refrigerate several hours or until thoroughly chilled. Cut into bars. I'm defying tradition and doing something completely unexpected by posting something pumpkin-y for Thanksgiving. Yeah, you can go ahead and say it--I'm a truly radical rebel. Although I'm anti-pumpkin, I feel that the presence of some rich and luxurious frosting can right any wrong, and that's the case here. 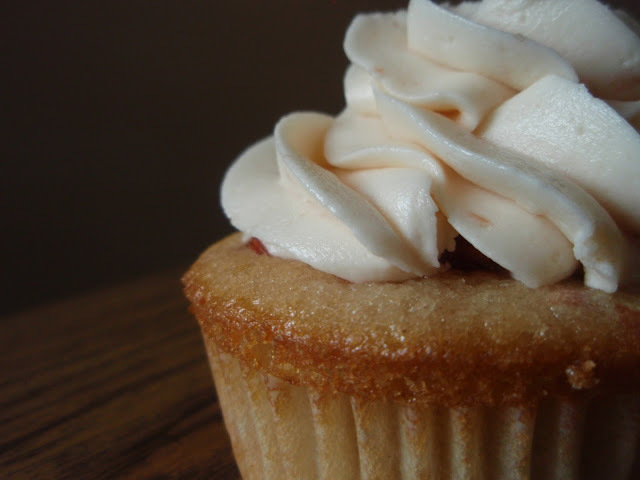 The fairly unpleasant cupcake (in my oh-so-humble opinion) is made marvelous by the smooth and decadent maple buttercream. The cupcakes are a breeze to make (no mixer required!) and the frosting isn't difficult either. You can add more or less maple syrup to your own tastes--I like more, but then again, I have a sweet tooth which cannot be sated. 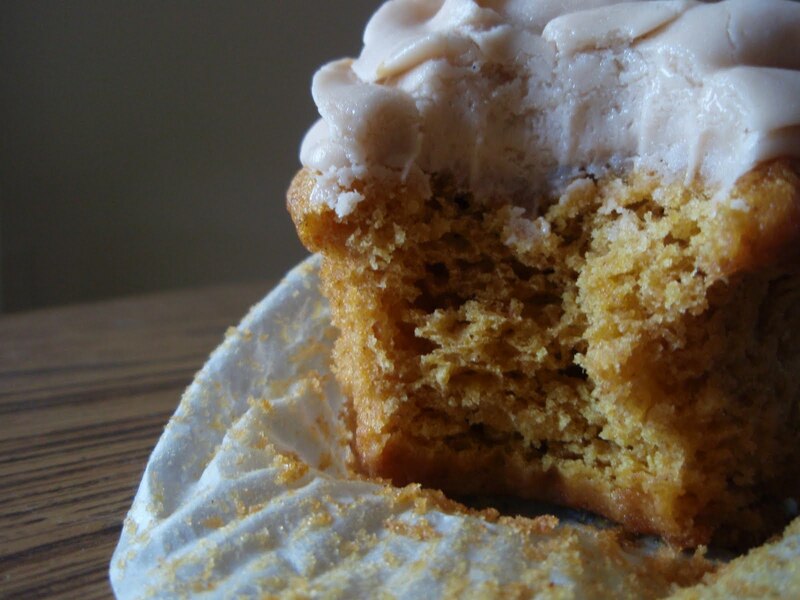 Even I must admit that the cupcakes aren't bad--they're moist, and the aromatic spice blend is grand. 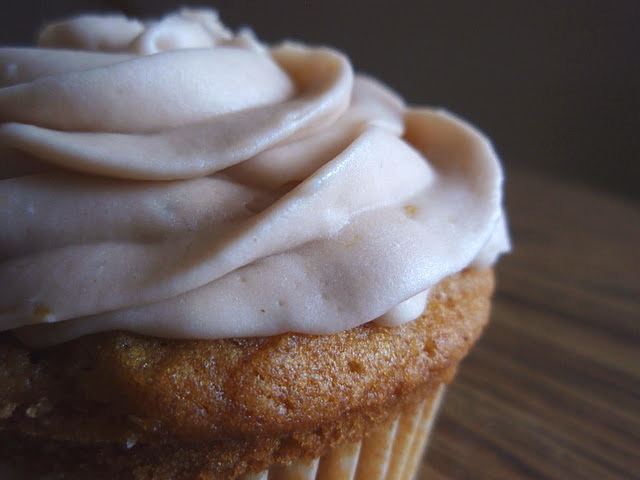 I'm really partial to the maple buttercream too, for obvious reasons. If you happen to have maple extract rather than maple syrup, it'll do the trick too; I just don't know a lot of home cooks who keep it in their cupboards. Have a happy toikey day, everybody! To make the frosting, beat the pulp out of the butter with an electric mixer for a few minutes. Add the maple syrup and milk and briefly blend. Add the powdered sugar gradually until frosting is thick enough to spread easily. You may not use all the sugar. If the frosting is too dry, add additional milk until desired consistency is reached. Preheat oven to 350 degrees. Line cupcake pans with paper liners; set aside. In a medium bowl, whisk together flour, baking soda, baking powder, salt, cinnamon, ginger, and cloves; set aside. That's right. I refuse to believe that the time for juicy, tasty strawberries is over. Even though I can see with my own two eyes the boxes containing 20% molding and festering berries, 15% yellowed and nowhere near deep-red berries, and 45% flavorless berries, I'll deny that it's not worth a couple of bucks for that last 20%. Those 5 berries are great. There will come a time, though, when there are no berries at all to be had. At that point, I'll express my gratitude for the strawberry jam and strawberry pie filling that's sitting atop my shelves right now. I like apples and pears and other autumn and winter fruits (as evidenced here), but they just don't hold the same appeal as strawberries. As far as I'm concerned, this is another super-successful cupcake creation. The cupcakes themselves are soft and flavorful--you've done it again, Martha! 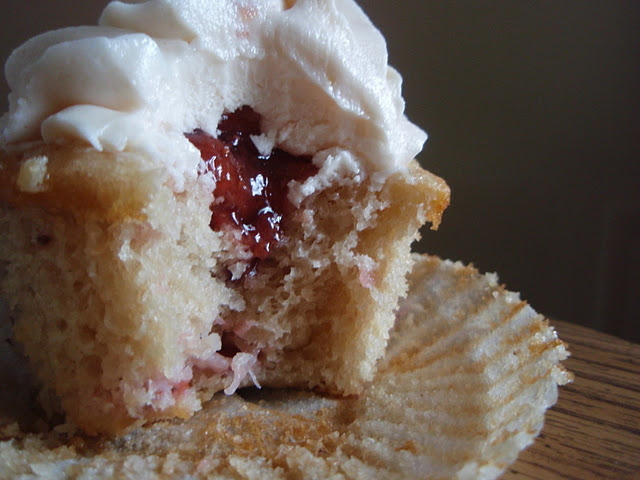 The sweet, oozing pie filling is a happy surprise and the subtle strawberry taste in the frosting is just right to finish. These aren't the neatest of all cupcakes, that's for sure--you might want to don a bib, or at the very least, be prepared to have strawberry goo running down your chin. Preheat oven to 350 degrees. Line standard muffin tins with paper liners. Whisk flours, baking powder, and salt in a large bowl. Cream butter and sugar with a mixer until light and fluffy. Add eggs and white, 1 at a time, beating after each addition. Reduce speed to low. Combine milk and vanilla. Add dry ingredients to butter mixture in 3 additions, alternating with wet ingredients and ending with dry. Scrape sides of bowl. Fold in chopped strawberries. Divide batter among muffin cups, filling each 2/3 full. 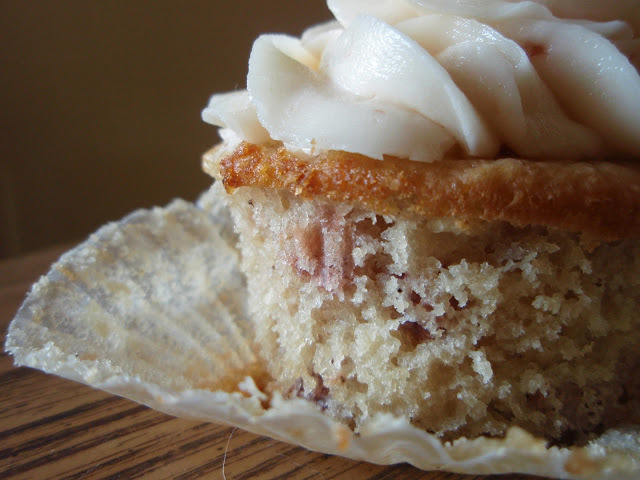 Bake cupcakes until testers inserted into centers come out clean, about 20 minutes. Let cool in tins on wire racks. To make the frosting, with an electric mixer, beat butter on medium-high speed until pale and creamy, about 2 minutes. Reduce speed to medium. Add the powdered sugar, 1/2 cup at a time, beating well after each addition and scraping down sides of bowl as needed; after every two additions, raise speed to high and beat 10 seconds to aerate frosting, then return to medium-high. This process should take about 5 minutes. Frosting will be very pale and fluffy. Add vanilla and jam, and beat until frosting is smooth. To fill the cupcakes, carve out a cone-shaped hole (and immediately eat the cone)(after adding frosting to it, of course) and carefully spoon the pie filling inside. Apply frosting generously to cupcakes and devour. Have you ever been to a diner and ordered a slice of pie? More often than not, it comes topped with a mountain of meringue, and I find that unfortunate. I recognize that it complements some pies better than a heaping portion of whipped cream, but I find it tasteless and a little bit gross. I hope I didn't offend anyone with that statement; to each her own. 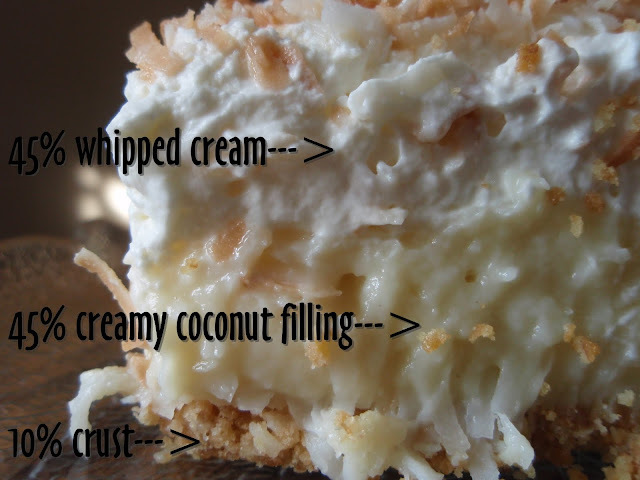 I simply prefer a blanket of sweetened cloud-like cream--it adds a touch of decadence to even the most basic of pies. Proper proportions? I think so. Some pies, however, don't need a touch of decadence. 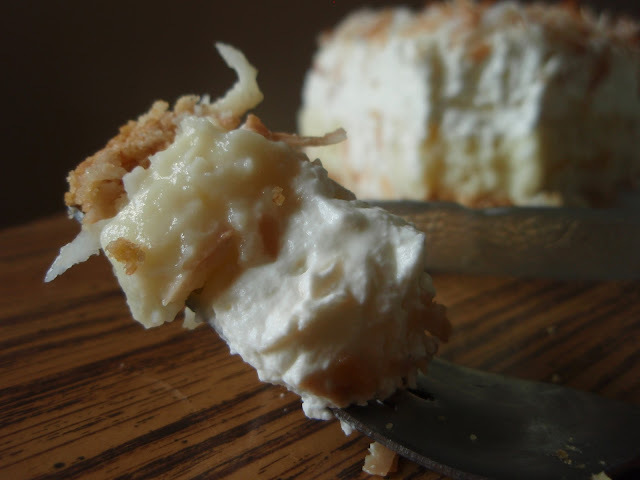 Case in point: Coconut cream pie. Lusciously velvety and oh-so-flavorful, with contrasting textures from the custard to the crust and toasted coconut on top, this is show-stopper of a dessert. So, while it doesn't need whipped cream to achieve delectable status, I figured it certainly wouldn't hurt. Whether by accident or subconscious choice, I ended up with equal parts filling and whipped cream. It was magnificent--dense custard and soft cream melting together in the mouth. The small bit of crunchy coconut on top was the perfect ending touch. I would really recommend this pie, topped with as much or as little whipped cream as you please. Or, if you insist, meringue. To make the crust, blend flour, sugar, and salt in processor. Add butter and shortening; cut in until mixture resembles coarse meal. Drizzle 4 tablespoons ice water over mixture. Process just until moist clumps form, adding more ice water by teaspoonfuls if dough is dry. Gather dough into ball; flatten into disk. Wrap in plastic. Chill 1 hour. Roll out dough between 2 sheets of plastic wrap to 14-inch round. Transfer dough to 9-inch-diameter glass pie dish. Fold overhang under. Crimp edges decoratively. Pierce bottom of crust all over with fork. Freeze crust 15 minutes. To make the filling, heat the milk, cream, and 1/4 cup of sugar until a thin skin forms on top. Meanwhile, viciously whisk together the remaining 1/4 cup sugar and egg yolks. Add in the flour, cornstarch, and salt and mix well. Temper in the very hot milk mixture, whisking well. Bring to a boil over moderate heat, whisking, then reduce heat and simmer, stirring constantly with a spatula for 1 minute (filling will be thick). Add the butter to the custard and let it sit for 15 minutes before folding it in, along with the vanilla and coconut. Pour the filling into crust, cover the surface of the filling with wax paper and cool completely, about 4 hours. Using electric mixer, beat cream, sugar, and coconut extract in medium bowl until peaks form. Spread whipped cream all over top of filling. Sprinkle evenly with toasted coconut. For another creamy treat (and one that's even MORE decadent), check out my bete noire on the Key Ingredient blog!